dun duna dun ana dun duna dun da dun duna dun ana dun d. ...Come one..come all to the 2008 Claymore Challenge Slopestyle Event. You will see big drops...back flips...tail whips!! That's right Mark and the crew at the HMBP have a great event in store for this weekend. 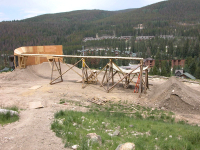 Visit the Highland Mountain Bike Park website to get more details. Make sure to stop by the Sinister Tent and cheer on the circus freaks....uh, we mean the Sinister Team Riders!! The Claymore Challenge is a slopestyle mountain bike competition at Highland Mountain Bike Park in Northfield, New Hampshire. Designed to address the growing need for a safe progression in freeride competition, the Claymore Challenge allows amateurs the opportunity to climb the slopestyle ladder in an environment catered toward them. The event has two categories; first is an amateur category directed for beginners and intermediate riders and second is a Pro/open which is for Pro’s and skilled amateurs who need to be given a chance to climb through the ranks. The contest allows riders the opportunity to showcase their skills toward a “Wild Card” grand prize; an all expense paid trip and invite to the Bearclaw Invitational August 21-23rd. Huh, what...ummm is there a piece missing somewhere??? Custer has been ripping it up here on the Right Coast, and now he is heading out (representing on his Sinister of course) to the Crankworx Freeride Mountain Bike Festival starting up next week. We are all fortunate to have a World Class Playground...Highland Mountain Bike Park....right in our back yard so we know Custer will feel right at home at the Crankworx event. Check out the Crankworx site to see what's new for 08. Good Luck Custer, keep us posted and mind the Gap!! Well it's here again already! The annual Diesel Bikes Demo Day Event at Lynn Woods on Saturday June 14th. We all had a great time last year and it's promised to be even better this year. Come out and support all the local bike shops and try out all the new bikes for 2008. Don't forget to stop by the Sinister Tent to check out the entire lineup. See you there!! recycled bicycles from the United States. Inspiring, determined, resourceful, individuals let us into their daily lives in a dramatic look at how lack of transportation can impact the education, health and livelihood of the community. Ayamye* is a moving, life-affirming film that proves sustainable solutions to crisis are not always complex. Ayamye* was produced in connection with Bikes not Bombs out of Boston. It was a selection of several film festivals including Phoenix Film Festival, Santa Barbara International Film Festival, Accra Environmental Film Festival, and Bicycle Film Festival. Ayamye* will be playing at the Frontier Theater in Brunswick on November 3rd. Well the time has come for us to head out into the desert and chaos called Las Vegas for the Interbike trade show. We will be a force out there this year, 2 new bikes, some new hired help and a new booth style. Interbike seems like a great big social gathering, so cool! We are out there to work though, so swing by the booth and check us out......BOOTH # 5053!!!!!!!!!!!!!!!!!!!!!!!!!!!! FTW will be on display in all his glory explaining his new creations, again proving he may be the coolest, most accessible and creative bike head in the world! also, our speed racer Pro superstar Jamie Ford will be on hand, signing autographs(cough) and inking 6 figure deals with components companies so he can deck his R-9 out to the hilt! So swing on by if you happen to be in the area and find out what's shakin' over in our world! last call for folks that want to check out a old school DH race/event right here in NH, 20 minutes up the road from Sinister! The courses are looking great and drying quickly. There's an "A" course and "B" course for different levels and or bike choices. You could easily race a Ridge on either course and be fine. You also get 2 runs which is nice and it only costs 22 bones to enter! Looks like we will have a pretty good group of guys from the "Sinister Family" up there including the Drummer Racing crew. I will be hosting a little after race bonfire/party so bring your tents and get ready to throw down. Highlands will be officially opening this weekend! It will be good to see this local jewel up and running. Been going up there to help since last late summer and it has really come a long way. The thought there is quality, not quantity. The place will just continue to improve as time goes on. The owners are all sick riders who have spent nearly 3 full years working on the project around the clock. The riding there will favor at least strong intermediate-expert riders initially until more beginner trails are added. We defiantely plan to be involved at the mountain, hosting demos, putting on jump jams and doing clinics. It will be our local testing ground for sure. Good to see such an emphasis on flow too! you could do all the trails on a Ridge if you are a competent hardtail rider...which somehow I am not anymore.I've hit the trails on both my r-9 and a prototype 7 inch travel freeride bike and both have advantages, but I'd say a freeride bike will be way more fun on the jump trail. Pretty sure they are the only lift access freeride bike only park in the nation! right in Northfield NH, which is 20 minutes north of the state capitol, Concord. One of the oldest still running bike shops around, West Hill Bike Shop in Putney VT will be hosting a Sinister demo on Friday July 21st between 5-8 PM. We will be letting people demo our DNA's, Ridges. R-9's and also you can catch a glimpse of some of our new projects.....if you're nice! There will be food, drink and music at the event and also our local satellite team which is co-sponsored by the shop, Drummer Racing will be present. Maybe you could finagle an autograph from Scott Moody? Call them at 802-387-5718 or check them out online at www.westhillshop.com, tell em' Skye sent ya'! Hope you're ready cuz' we're coming to a town near you! We are out in force this summer for sure, riding, repping and raging. At the end of July we will be in Lanesboro for the Pedrosfest where we will have a booth and be featured with our Sinister Bikes Jump Jam and possibly with some DH clinics taught by our factory racers and FTW himself. Look for Derek Stevens, Clint Mchahon, Sasha Yakovleff and Dane Berk to be shredding and designing some incredible jumps and stunts. Last year, the big dirt pile took over so we will be spending lot's of time there, for sure! We will also be at races, demos and other events as they develop. We will try and keep you informed best as we can and let us know if you want us to be involved with your event!